For an animal on the verge of extinction, panda has never been more popular than they are in zoos. And one panda that is taking Japan by storm is baby cub Xiang Xiang. 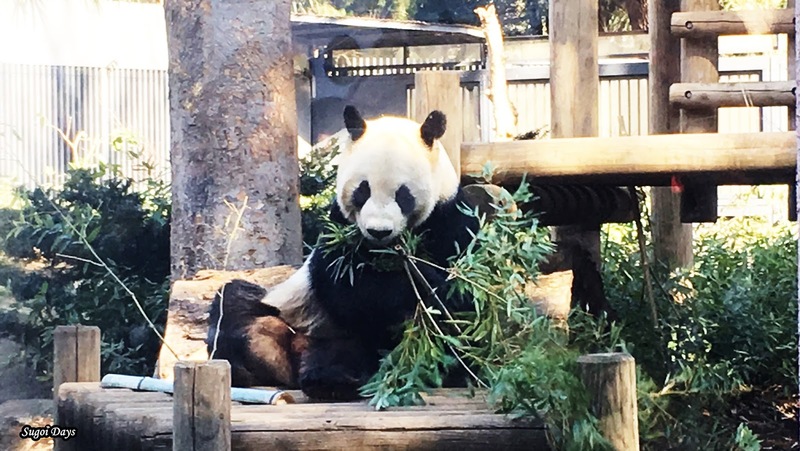 Born to mother Shin Shin and father Ri Ri in June 2017, Xiang Xiang is Ueno Zoo's symbol of adorable or as the Japanese would say in high pitch voices, kawaii~~! 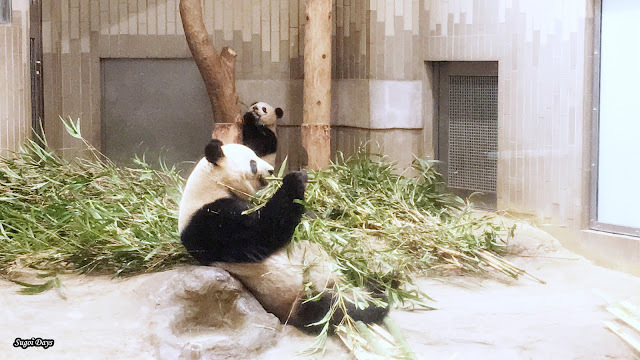 Naturally when the zoo introduced the first come, first served ticketing system to see the baby panda to the public in February, thousands of Japanese and tourists flocked to the zoo in the wee hours of the morning to obtain the viewing ticket (which does not include the entrance ticket). 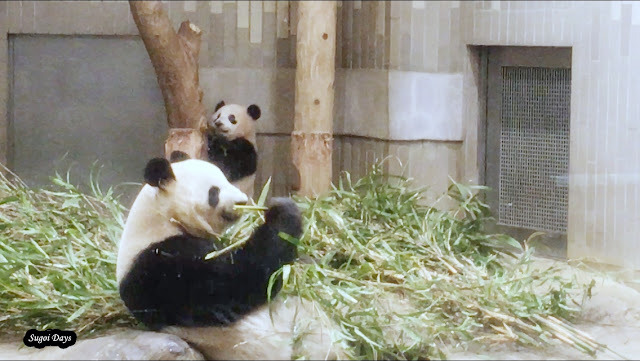 And it just so happened that I was in Tokyo just around that time and decided to try my luck at seeing the celebrity panda. I combed the internet for information on the ticketing system, to see if advanced reservation was possible or if it was possible to purchase the entrance ticket beforehand. No such luck. Unless you have an annual pass, zoo visitors need to purchase the entrance ticket on the day itself when the zoo opens at 9:30am. There wasn't much information on the ticketing system as well but amen to Instagram, from which I was able to get a gauge of what time I need to be there to definitely get the tickets. The answer to that is 8am. When I got there, there was already a long queue of more than 200 people ahead of me waiting to purchase the entrance ticket. On the right side, there was another queue for the annual pass holders. Equipped with my music, videos, coffee and biscuits, I settled in for a 90 minutes wait for the gates to open. All around me, the locals pulled out their Daiso foldable chairs and mats to sit on. Most of families had a representative in queue and they would hop in when the line started moving. Nice to know that kiasu is an Asian thing and not just Singapore exclusive. At 9am, the zoo staff would direct people into the vending machine lanes and at 9:20am, those first in line can start purchasing the tickets as the gates opened up. Of course, the annual pass holders got to go in first. It took me 15 minutes to purchase my ticket from the vending machine and as soon as I was through the gate, I got my ticket stamped and joined the stampede of people rushing to the left, towards the five-story pagoda to join the line to get the actual tickets to view the baby panda and her mother. The panda viewing enclosure is on the right side and already a queue had formed there consisting of those who got the first slot at 9:35am. Visitors are allocated to a specific 20 minutes slot started from 9:35am right up to the last slot at 410pm, according to their tickets. I scored the 11:10am - 11:30am slot while a friend of mine who got in later, got the 4:10pm - 4:30pm slot. By 10:30am, all the tickets were given out. No collection on each other's behalf to be fair to other people. If you're worried that this would mean that you would have to spend the whole day at the zoo, well don't be. Because as long as you have a panda viewing ticket, you can leave and re-enter the zoo later on for your viewing slot. Otherwise, re-entry is not allowed. At 11:10am, I queued up to enter the enclosure and it was another 15 minutes before it was my turn. We entered in groups of 15 people and were required to follow the group's allocated block as we moved along the enclosure. The enclosure was broken up into three section, one outdoor and two indoors. 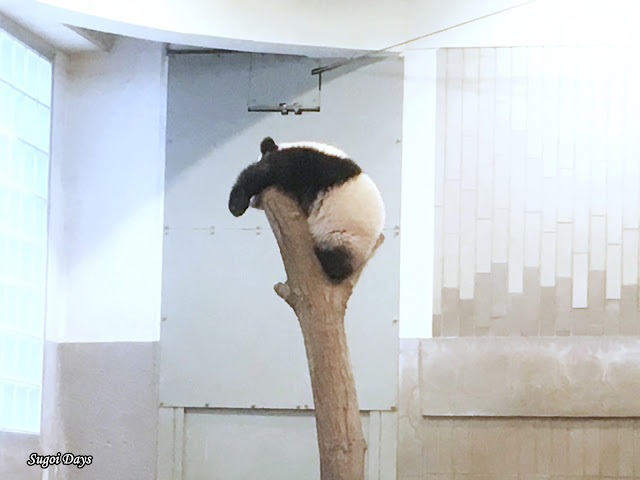 Mummy Shin Shin was spotted lounging in the open area, munching on bamboo shoots while the starlet herself was sleeping on her favourite perch in the indoor door. This was to be expected of a panda. Mommy Shin Shin pondering motherhood. Luckily for me, my friend gave me their afternoon slot and after wandering about the zoo for almost the whole day, I went back at 4:20pm to join the last viewing group. 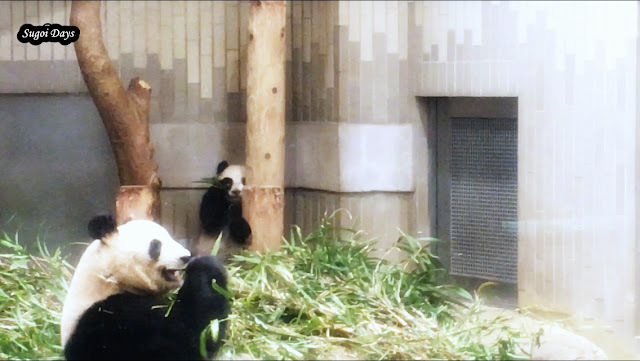 And to my delight, Xiang Xiang was up and happily munching away at her bamboo shoot in the background of the enclosure while her mother was up front, still eating. The baby cub was definitely well worth the wait for me. Now, say it with me....kawaii~~~! Mind you, when I went to the zoo, it was on a public holiday in Japan and it did feel like majority of the visitors there were local. I reckoned the weekdays would be less hectic with shorter waiting time and queues. I don't know how long this system will be in place but for now, if you want to see a famous baby bear, queuing up at 8am - 8:30am seems like the way to go. Alternatively, wait a few more months for the craze to blow over OR just go to see daddy Ri Ri. Price: 600 yen (adult), 300 yen (senior citizens, 65+), 200 yen (students, 13 - 15), free for childre.